There are a number of papal documents that seem utterly bizarre to read nowadays because of our retrospective knowledge of how totally and absolutely they were ignored and contradicted after their promulgation. The three most astonishing examples of this particular genre (as it were) might very well be a trio all having in common their liturgical essence: Pius XII's Mediator Dei of 1947, reining in the excesses of the liturgical movement; John XXIII's Veterum Sapientia of 1962, solemnly reaffirming the central place of Latin in the Church's life; and Paul VI's Sacrificium Laudis of August 15, 1966 -- fifty years ago today. 62. Assuredly it is a wise and most laudable thing to return in spirit and affection to the sources of the sacred liturgy. For research in this field of study, by tracing it back to its origins, contributes valuable assistance towards a more thorough and careful investigation of the significance of feast-days, and of the meaning of the texts and sacred ceremonies employed on their occasion. But it is neither wise nor laudable to reduce everything to antiquity by every possible device. 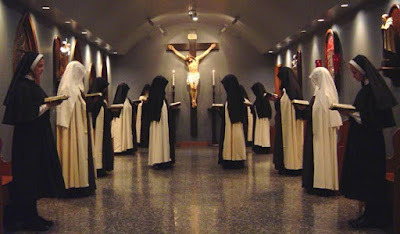 Thus, to cite some instances, one would be straying from the straight path were he to wish the altar restored to its primitive table form; were he to want black excluded as a color for the liturgical vestments; were he to forbid the use of sacred images and statues in Churches; were he to order the crucifix so designed that the divine Redeemer's body shows no trace of His cruel sufferings; and lastly were he to disdain and reject polyphonic music or singing in parts, even where it conforms to regulations issued by the Holy See. [T]he “knowledge and use of this language,” so intimately bound up with the Church’s life, “is important not so much on cultural or literary grounds, as for religious reasons. … For the Church, precisely because it embraces all nations and is destined to endure to the end of time ... of its very nature requires a language which is universal, immutable, and non-vernacular” (Pius XI). … [T]he Catholic Church has a dignity far surpassing that of every merely human society, for it was founded by Christ the Lord. It is altogether fitting, therefore, that the language it uses should be noble, majestic, and non-vernacular. In addition, the Latin language “can be called truly catholic.” It has been consecrated through constant use by the Apostolic See, the mother and teacher of all Churches, and must be esteemed “a treasure ... of incomparable worth.” It is a general passport to the proper understanding of the Christian writers of antiquity and the documents of the Church’s teaching. It is also a most effective bond, binding the Church of today with that of the past and of the future in wonderful continuity. 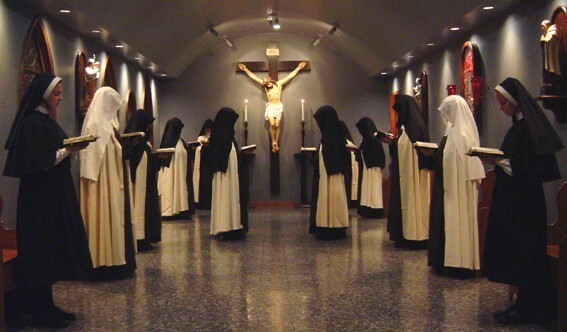 But in many ways the greatest tragedy of the postconciliar period was the sudden, dramatic, worldwide collapse of religious life, especially in its contemplative branches, and the disappearance, as if overnight, of the chanting of the Divine Office in Gregorian chant. It was an anti-miracle, so to speak -- a feat of Satan who, appearing as an angel of light, lured the religious to their doom. The praises of God, which had been sung day and night for well over a millennium with melodies more beautiful than any the world has ever birthed before or since, fell silent, with the silence of the tomb. And yet, Pope Paul VI, in words no less clear, stalwart, principled, and prophetic than those he uttered about birth control in Humanae Vitae, urged religious in 1966 to uphold their traditional choral office at all costs, for it was their special contribution to the life, health, and growth of the Mystical Body. While it is true that Paul VI, with his self-admitted Hamlet syndrome, walked a zigzag path in contrary directions, seeming to be trapped in the torments and doubts of his age, he nevertheless rose above the churning waters now and again to speak a clear word that, had it only been followed, would have been a blessing for the Church. 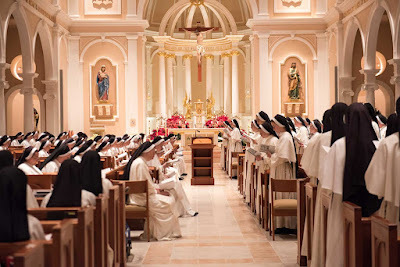 My purpose, however, is not to go into this vexed and over-complicated pontificate, but merely to commemorate the half-century anniversary of the much-neglected and yet wonderfully luminous Apostolic Letter of August 15, 1966, and to make its content better known, for the encouragement of all who strive, today, to restore to the Divine Office its full textual, musical, and ceremonial splendor, whether in the monastic rites, the old Roman usage, the Pius X reform, or the Pauline Liturgy of the Hours. Beloved sons, health and apostolic blessing. Your families, dedicated as they are to God, have always held in honour, as an offering from lips that confess to our Lord, the ‘Sacrifice of Praise’: that is, the psalms and hymns by which the hours, days and seasons of the year are hallowed with religious devotion, in the midst of which the Eucharistic Sacrifice shines, as it were like the sun, and draws all things to itself. With good reason is it held that nothing should be preferred to so holy a work as this. It is not difficult to perceive how much honour is rendered by it to the Creator of all things, or what benefits it confers upon the Church. You have proved, by following this fixed and unceasing manner of prayer, what importance divine worship has for human society. You yourselves know well how greatly We love your religious families, and how we value them. You can have no doubt of this. We have often marveled at the examples of outstanding holiness and the products of deep learning which ennoble them. We think it a happiness if We are able, in any lawful and fitting way, to support them, to comply with their wishes, to take thought for their betterment. What is in question here is not only the retention within the choral office of the Latin language, though it is of course right that this should be eagerly guarded and should certainly not be lightly esteemed. For this language is, within the Latin Church, an abundant well-spring of Christian civilisation and a very rich treasure-trove of devotion. But it is also the seemliness, the beauty and the native strength of these prayers and canticles which is at stake: the choral office itself, ‘the lovely voice of the Church in song’ (Cf. St Augustine’s Confessions, Bk 9, 6). Your founders and teachers, the holy ones who are as it were so many lights within your religious families, have transmitted this to you. The traditions of the elders, your glory throughout long ages, must not be belittled. Indeed, your manner of celebrating the choral office has been one of the chief reasons why these families of yours have lasted so long, and happily increased. It is thus most surprising that under the influence of a sudden agitation, some now think that it should be given up. Obey, then, these prescriptions sincerely and calmly. It is not an excessive love of old ways that prompts them. They derive, rather, from Our fatherly love for you, and from Our concern for divine worship. Given at Rome, at St Peter’s, on the 15th day of the month of August, on the feast of the Assumption of the Blessed Virgin Mary, in the year 1966, the fourth of Our pontificate.